These poems drag you across a chipped, splintered, greasy landscape; some parts will cut into you while the smoother turns of jesting leave an uncomfortable trace. There is a sliding landscape here. In one plain it is almost geographically mappable with cultural nuances and bits of detailed grit scratching their marks as they slip across something navigable, although the collection’s title hints that even that compass is bust. Across another plain, however, the geopoesy is harshly constrained; boxed up in rooms, derelict voids, TVs, hangovers, sour relationships. Within and just across the bounds of this containment is an anomalous romance and romanticism; edgeland blooms – “he dreamed a rose - / petals blowing into s skip” - and the absent or comatose lovers that do, at the very least, remind us of the unlikely possibility of return. 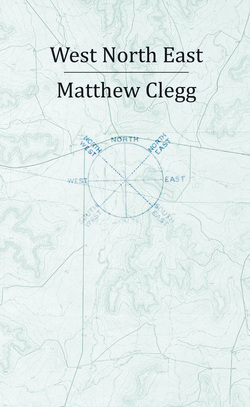 Matthew Clegg finds the stellar in the gutter, sometimes literally – “[A] hubcap like a felled star”. In his ‘Edgelands’ sequence of poems these images come relentlessly. Not dereliction highlighted by the relief of accidental aesthetics, but a waste land that is invariably and painfully artful: from the song of starlings on a power line, a skip in which “corkscrews of steel shavings catch sunlight” to the smashed windshield that evokes “the car, / wide open to wind, pollen, rain”. Under the cables are fishing ponds; a rushing sound may only be the wind or it may be a buried river “under the tarmac”. With each product, ailing in outmoded modernism – steel shavings, automobile parts, tarmac – comes a natural counterpart: sunlight, wind, river. Initially startling, these pairings begin to take on a collective and mutual bounding and binding. The shards of a pixelated romanticism are everywhere; together, the relief is almost oppressive. As if there were not a real contrast here, at all, but that each of the momentary escapes of the poems – stumbling into a herd of cows, finding “quiet... [R]ound the back of the estate” - are no more than the curve of the loop back to the start of the break. Across and about these punctuated sites, “passed out on some bricks”, a multiple consciousness floats in and out, for which “[A]lone made perfect sense”, sometimes reluctantly walking away from a partner’s stupor and at other times fortified behind a bedroom window “lagged... with quilts”. The personal politics of booze is important here. Taken exactly, stepping away from “standing urine”, it can be the shot that lifts off like “a Chinese lantern... carry[ing] light through liquorice clouds / steaming above the Bassett’s factory”. Yet, no matter how high the flight the landscape below never changes much in its ranging from the last limps of mass production to the perverse flowerings of its voids. Sometimes, the alienation here is extreme, the permanent distraction of drama – “DVD box sets on a loop” – but equally, there is a free consciousness that floats about abject sites, able to enjoy its anomalies, unable to put them together into a way out. All the worse for not being unrelieved, this is a savage cartography of restriction and confinement, unflinchingly depicting a vicious grid across which, in boxes of melodrama, a girl “[H]e thought... was kneeling at an easel” is “couched at a pushchair”, a woman stands protectively over a beaten boyfriend “a fighting heron over her fallen mate” and “[L]acking anything else, two teenage girls / take photo after photo of each other”.